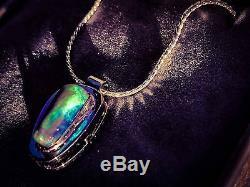 9ct white 9 gold Solid Black Opal Pendant. Opal Size - 4-5mm wide and 11 mm long with a depth of 4mm. Tooth Shaped solid black opal from Lighting Ridge in northern N. It has Strong flashes of blue and green in full and dull light and almost every angle. Pendant Size - 11 mm wide, 15mm high and a depth of 6mm. About 2 grams of 9ct white gold. Handcrafted Pendant is a one of a kind. Made in Australia by a local. Sean with a hallmark For 9 ct white Gold. The photos do not do this piece justice, its a beautiful design. FREE Box and silver necklace. We post worldwide and all item will be insured. Contact our team anytime and we will get back to you as soon as possible. Thanks For Shopping with Stick-Dat Australian Made and Owned. 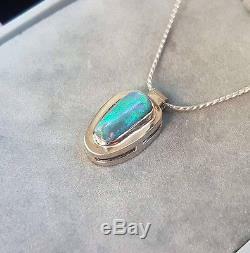 The item "9ct white gold Solid black opal pendant Australian handmade necklace blue green" is in sale since Saturday, May 6, 2017. This item is in the category "Jewellery & Watches\Handcrafted Jewellery\Necklaces & Pendants". The seller is "shop-stick-dat" and is located in Kingscliff, NSW.